Queen’s 1978 classic, “Don’t Stop Me Now”, is featured in a new Super Bowl commercial for Amazon. Billboard reports the ad centers around failed beta testing for the company's voice activated assistant Alexa – entitled "Not Everything Makes The Cut" – and includes the Queen track alongside a number of celebrities, including Harrison Ford, Forest Whitaker, Broad City stars Ilana Glazer and Abbi Jacobson, and NASA astronauts Mark and Scott Kelly. 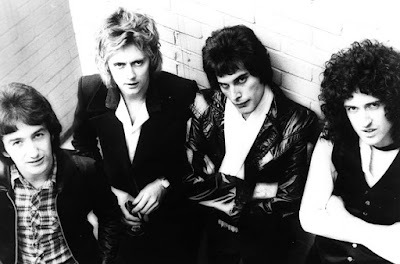 “Don’t Stop Me Now” was the second single issued from Queen’s seventh album, “Jazz”; the tune topped the UK charts while the project hit No. 6 on the US Billboard 200. Queen recently released an expanded home edition of their 2018 biopic “Bohemian Rhapsody” on digital, and it will be available via 4K Ultra HD, Blu-ray and DVD on February 12. Directed by Dexter Fletcher, the film follows Queen from their creation in 1970 to their legendary Live Aid appearance in 1985. On February 24, “Bohemian Rhapsody” will compete for five Oscars – including Best Picture – at the 91st Academy Awards.